The abandoned Gowanus Whole Foods site closes out the year the way it spent much of the last half of 2007: wide open to visitors that want to check it out. The environmentally-challenged site got some attention in November when Public Advocate Betsy Gotbaum and others criticized the grocer for maintaining a public hazard. Well, attention from public officials can have a very short half life. 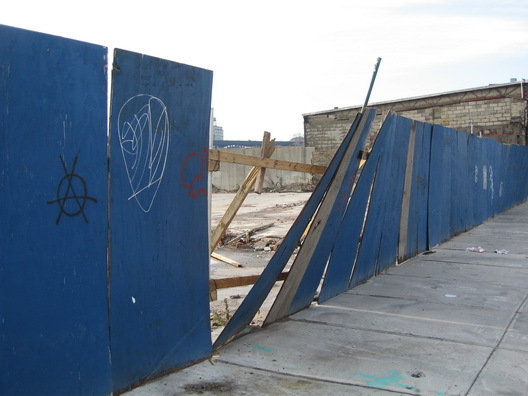 The site was closed up for a couple of weeks, but the shoddy fence has been more open than closed ever since. (A reader notes that even the portable toilets on the site have been removed, which we suppose is one way of economizing.) Advice to the grocer that own the toxic property that gets many, many, many visits: invest in a work crew, buy some new wood, get a lot of nails, install a sturdy new fence around the property & keep an eye on it. Will Brooklyn's biggest toxic playground remain to entertain in 2008? Keep watching. We will. I was going to ask what you knew about this. I work across the street from the site, and both the construction signage (naming Whole Foods) and the (expired) permits have been removed. The trailer on the property is empty, and the portajohns have been removed. This would be great news. I love Fairway. I love Gowanus. I love that Trader Joe's will be opening soon. Whole Foods is WalMart for the organic set, with triple the prices. DOB shoew Whole Foods applied for shoring&underpi permits for a new building. Application date 12/19/07. Application is "disapproved". So, any bets on if Whole Foods EVER opens on this site? My bets are 5 to 3 against. So funny. Whole Foods was just that when it started in california. But, brooklyn ain't cally. Why do people have to shop in hyper markets anyway? At least fairway hasn't changed. What is this world coming to?